Comfort food is always there for you. During harsh winters and cool fall evenings, comfort food will warm you from the inside out and remind you of home. If you are going through a bad break-up, comfort food is there for you when nothing else seems to help. You don't need a reason to enjoy these classic comfort foods. Just fill up your plate and enjoy! Everyone has their ultimate comfort food recipe. Some people favor a big bowl of cheesy pasta and some people favor a loaded soup recipe. And what's that common element that unifies comfort food? Heartiness. 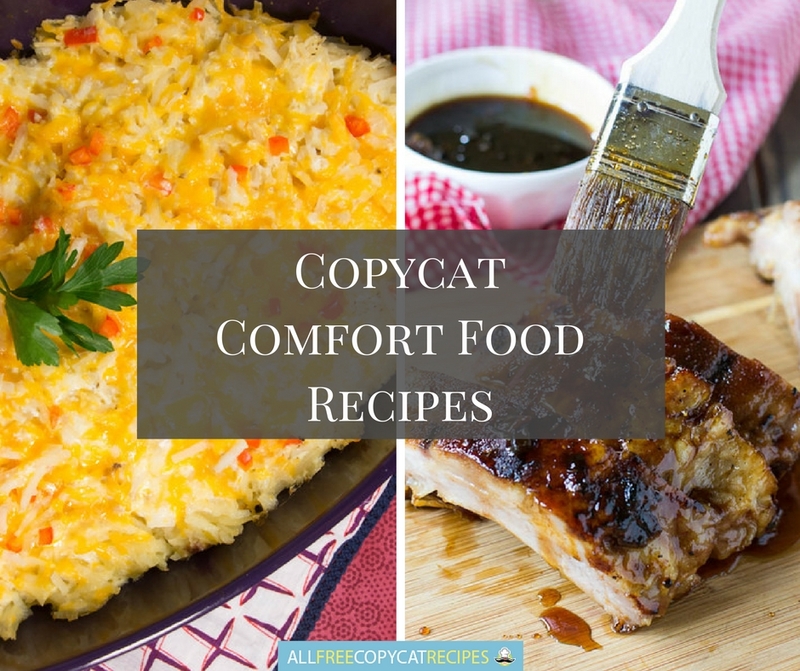 These 22 Copycat Comfort Food Recipes are sure to raise your spirits and make your grey days bright and sunny! Start the day feeling good with these breakfast comfort food recipes. Copycat Cracker Barrel Hash Browns Casserole - Serve yourself a heaping helping of this tasty casserole copycat from Cracker Barrel! Copycat IHOP Pumpkin Pancakes - Yum! These pumpkin pancakes are a great way to start your day on a bright, sunny note. 1950s Diner Hash Brown Recipe - These hash browns will remind you of the good old days. There's really nothing better than diner food. KFC Biscuit Copycat Recipe - Biscuits are the essential comfort food recipe. These copycat biscuits from KFC will warm you from the inside out. Imitation Gooey Cinnabon Cinnamon Rolls - A warm and sticky breakfast is just the way to indulge in comfort food. Doughnut Pancakes with Doughnut Glaze Syrup - Two comfort foods all wrapped into one outstanding breakfast dish! Copycat Pillsbury Toaster Struedel - This copycat recipe is just like the brand-name food. They are simple, yet satisfying. These entree dishes take comfort food to the next level. Knockoff KFC Fried Chicken - Southern food is the best way to get your comfort food fix -- espeically KFC recipes. Copycat Jack Daniel's Ribs from TGI Friday's - These rich and savory ribs are packed with flavor! Cracker Barrel Copycat Sunday Homestyle Chicken - This fried chicken recipe is a real down-home classic. 30 Minute Chicken and Dumplings - This comfort food recipe literally takes 30 minutes to make. Comfort food doesn't get easier than that! Copycat Mini Pot Pies - These are adorable individual pot pies that will bring a smile to everyone at the table. Copycat Panera Chicken and Wild Rice Soup - This soup recipe is so hearty and soothing, that it could definitely be considered dinner. Copycat Olive Garden's Chicken Alfredo - This dish is rich and creamy in all the right ways. Knockoff Martha Stewart Mac and Cheese - Mac and cheese is known as one of the ultimate comfort foods. This skillet variety is just right. Sometimes when you are looking for comfort food, all you really want is a lot of sugar and chocolate. These indulgent copycat comfort food recipes for dessert will hit the spot. Rowdie Redneck Brownie Recipe - This brownie recipe is as tasty as it looks! Southern Homemade Jam - Jam is always better when it's homemade. Give this recipe a try and see for yourself. Southern Farm Apple Butter - This apple butter recipe is simple but oh so tasty. Do this classic fall dessert the homemade way. Cracker Barrel Inspired Pudding Cupcakes - These cupcakes are a crowd favorite copycat Cracker Barrel recipe. Copycat Texas Roadhouse Big 'Ol Brownie - Nothing says comfort food like a big brownie smothered in hot fudge sauce. Copycat Ben and Jerry's Cherry Garcia - Ben and Jerry's is synonymous with comfort food and this copycat is just as good as the real thing. Copycat Mrs. Field's Chocolate Chips Cookies - Sometimes all you want is a giant chocolate chip cookie. This classic American cookie recipe is divine.